A columbarium (vault with niches for urns containing ashes of the dead) is located in the Columbine Glen Sanctuary directly east of The Church at Woodmoor. According to GPS-derived geolocation (accurate to within 10 meters), the columbarium's coordinates are 39°05'43.1"N and 104°49'39.4"W. The church is reached by taking the Monument exit (161) off Interstate 25 and traveling east on Highway 105 approximately three miles. The church is about one-half mile north of the intersection of Highway 105 and Furrow Road on the east side of the road. The Church at Woodmoor was founded in 1973, and the concept of the columbarium was developed by Pastor Wasson. Seventeen of the 54 niches in the vault are occupied. The earliest death interred here is 1978. Sexton records are maintained by the church at (719) 488-3200. 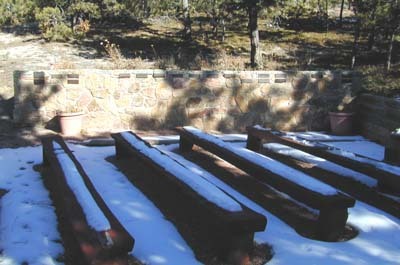 The Columbine Glen Columbarium is well maintained and located in a quiet forest retreat consisting of ponderosa pines and Colorado's native flowers. The columbarium consists of an open-air raised platform faced with a rock wall. Rows are numbered 1 through 18 and plots are designated A through C. A small amphitheater is located adjacent to the columbarium. Columbine Glen Sanctuary is used for baptisms, weddings, and memorial services, as well as meditation and prayer.